The OSIRYS project will look to improve indoor environmental quality and energy efficiency by developing forest-based biocomposites and products for facades and interior partitions to be applied in retrofitting and new building construction. Indoor air quality and emissions from building materials have been over recent decades a major challenge for scientists, industry and consumers as traditional construction materials contribute to contaminants. 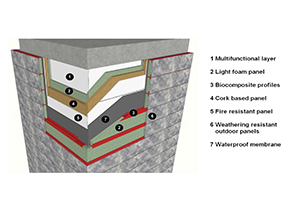 OSIRYS, a four-year project, will work with new eco-innovative building materials, which are able to provide a healthier indoor environment, to develop a holistic solution to the current emissions challenges facing the construction industry. To achieve this, the project will focus on the development of forest-based biocomposites, taking into account their different functionalities to meet the strictest requirements of the Building Code. The new materials will improve air quality by eliminating microorganisms, increasing thermal and acoustic insulation and controlling breathability of the construction systems. The OSIRYS consortium comprises: NetComposites and Plastil from the UK, Acciona, AIMPLAS, ENAR,VISESA and Tecnalia (Project Coordinators) from Spain, Fraunhofer, SICC and Tecnaro from Germany, IVL and Malmö Townhall from Sweden, VTT from Finland, Omikron from Hungary UNStudio from the Netherlands, Bergamo Tecnologie from Poland, Collanti Concorde from Italy, and Amorim Cork Composites from Portugal.